Brandon Okamura shares his projects as a second year student. Kathy Chen talks about the advancements with the 3D printer in the materials engineering department. Cal Poly is full of many great minds, looking for ways to either make their lives easier or help others in the same way. Both a software and a hardware prowess is present in all grades here. Sophomore Computer Engineer Brandon Okamura works on his computer set-up in Poly Canyon Village. A great example of somebody doing just that is second year computer engineer Brandon Okamura. “Cal Poly is one of the best engineering schools, and I’m glad I’m going here,” Okamura said. He’s working on an RFID, radio-frequency identification, scanner that will be able to scan his phone and it turns his computer on and off. A developing project, that allows him to turn stuff on and off wirelessly. Okamura has a set up in his room that allows him to access a website from his computer to turn on and off his fans and lights. His goal with the major is really just to have fun, he likes it and it’s what he does. Programming is his goal after school. He currently works at Tapestry Solutions, and for about 15 hours a week he goes there and programs for them. Last quarter the materials engineering department got a 3D printer for the first time ever. It’s quite an achievement for the department as they can now prototype their ideas before they completely make it. “We had the MATE freshmen each come up with a Solidworks drawing that got 3D printed for them,” Kathy Chen professor of materials engineering as well as the department chair said. Solidworks is a 3D design tool that allows you to create 3D models to visualize in a computer that can then program the printer to create. “Our juniors are currently using the Makerbot for some projects,” Chen said. The objects at the moment are pretty small, but still cool precursors as to what can happen in the future. Apparently, it takes a much longer time, and longer planning for something to be printed with a hollow center. 3D printers are the new cutting edge of the technological world as they have so many uses. It will be interesting to see how the department uses it to make projects in the future. My interview with Emily Ferguson about how frequently she updates her mobile phone. How much do you use your phone on a day to day basis? This was a single question interview with Emily Ferguson, recorded outside of the Avenue eatery. Emily: No, should I elaborate. I can’t update, because I don’t have enough memory. So, still on iOS 6! My interview with Michael Hehmann on what he does the majority of the time with his electronic devices. What would you say you use your electronic devices for, mainly? I interviewed my friend Michael outside of the music building one morning. Michael: Mainly, I would say, access to the internet for entertainment purposes, for the most part, but also sometimes work. My interview with Jamie Reich on how much she uses her phone everyday. How much do you use technology on a day to day basis? I managed to interview Jamie outside of the Avenue near the UU. Jamie: Every hour, on the hour. Bill Trammel on his new app, Expresso. Jonathan York on how entrepreneurs don’t have as many obstacles as before. An app that allows you to preorder your coffee and set your arrival time, so you can pick it up when you get there, and skip the line. That’s the premise behind the new app Expresso, being developed by one of Cal Poly’s own Bill Trammel an industrial design alumni. Blackhorse, High Street Deli, West End Cafe, and a couple of others are the few they plan to support at this time. They explain that they will use San Luis Obispo as a medium-sized market to hone their business and then port it out to larger areas. It’s still large enough to do the server volume tests and see when the peak times of day would be, he said. This way they can help businesses out with the resource side of things. The same premise is being applied for fast casual food dining, like Chipotle or Subway, and I just wanted to apply that to the coffee market, which is a fairly large market. “We’re basically creating a self-serve platform for coffee merchants,” Trammel said. Once they have a small gathering of shops set up here locally they can start to market the product to entire corporations to use as their own personal self-serve platforms. They have to get the basics working first. Expresso was one of the runners-up in the frenzied weekend known as Startup Weekend SLO a few weeks ago. We had a fully functioning app that we showed off at start-up weekend, but it really focused on one shop. The idea came earlier however. “The actual execution all happened over startup weekend, I had the idea probably, like, three weeks prior,” he said. He said that he posted on Facebook about what he should call the product and someone mentioned Expresso and he liked it. There are fewer obstacles for entrepreneurs today than there ever were, according to Jonathan York, Associate Professor at Orfalea College of Business. You can do all sorts of stuff you couldn’t do before, so in that way it’s actually easier for entrepreneurs. There is still a few key obstacles however. The public has somehow created a very boring and specific stereotype of computer programmers from pop culture and other references. Cal Poly is blessed to not only have rockstar computer and software engineers, but also have those same people do fun and extracurricular activities. From the arts, to sports, to helping others, our fellow classmates are involved everywhere. Freshman computer engineering major Jeremy Chen, who not only participates in the campus’ A Capella group, That’s the Key (TTK) as their beat-boxer, but also plays piano as well as cello. He has only tried small things back at high school in this field. 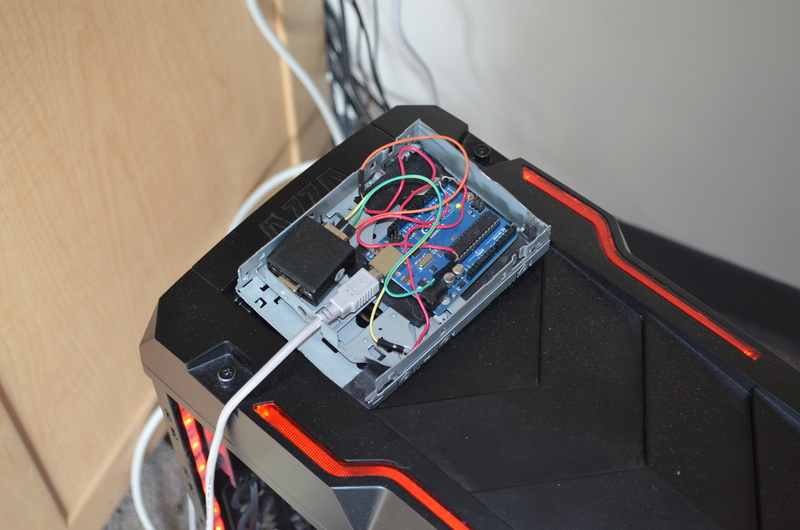 “I would try programming my own private servers for games and stuff,” Chen said. 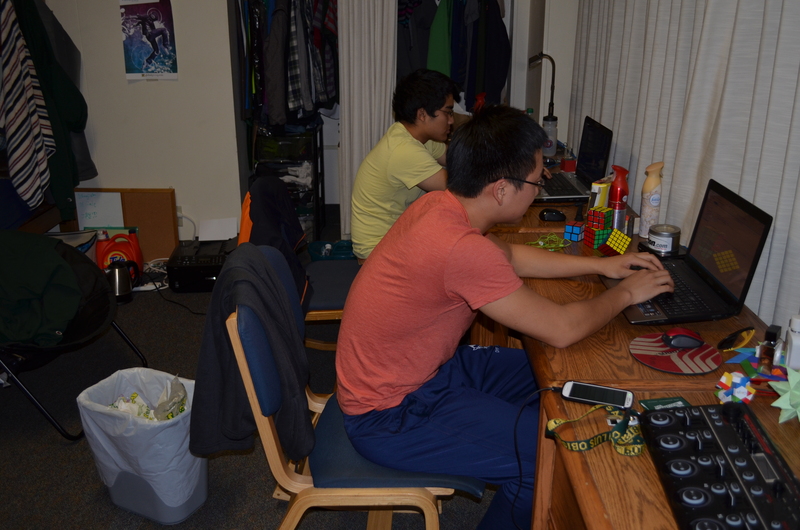 Jeremy Chen works on his computer late at night, while his roommates sit next to him and play League of Legends. His desk almost looks ready to fit right in at Google. While Chen is new to the programming world, he said he does know some C, which is a programming language. He says that he didn’t really know about Java, another language, and unfortunately some of his classes this past quarter dealt with those concepts. Learning languages seems to be a constant theme for many computer programmers. 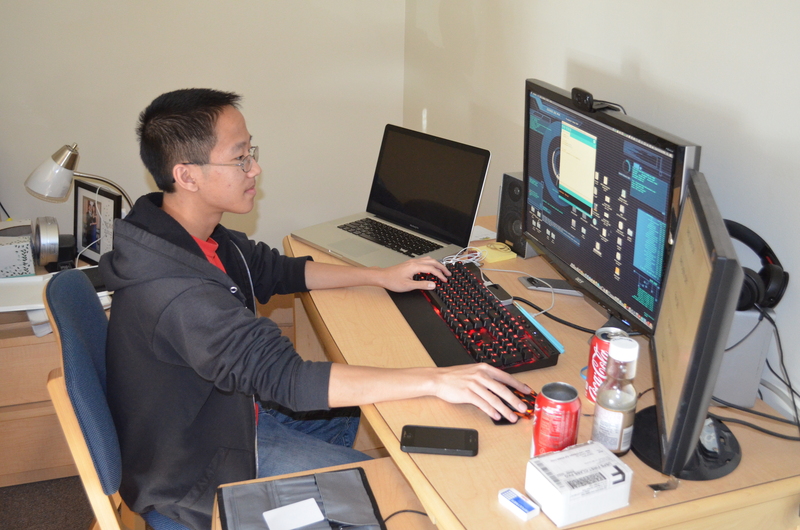 “Whenever I have time, I try to learn new programming languages on my own and create projects on my own,” Dat Tran, second-year software engineer said. From a second year perspective he’s not sure if you could call the teachers motivational on the experimentation side. Although they may encourage you, they really only expect you to know what they teach you in class. Tran said that he doesn’t have any projects outside of what he is being taught how to do in school. He said he is definitely learning languages on his own. At this time he doesn’t have a job, but he’s always looking. “I’d like to get a little bit more involved with stuff outside of school, he said, I am looking for internships right now,” he added. “Ideally music software or something related to music, I also really like music, and I’m minoring in it; or something in graphics,” said Tran. He did mention that he wouldn’t mind working at Google if he had the chance. These two students are proving that Cal Poly really has an edge when it comes to interesting people in computer science majors. York is an associate professor at the Orfalea College of Business. He also mentioned that he came to work at Cal Poly because it was in it’s prime for innovation. That’s not to say it has fallen. With the amount of support it gives to the Center for Innovation and Entrepreneurship and how the university is looking into inter-disciplinary work across colleges Cal Poly will remain quite successful for the next 10-15 years. We all know there are many successful students the graduate from Cal Poly each year, but how many do so with a successful business as well. Orfalea College of Business Associate Professor Jonathan York said. He works with students to help them understand and experience the challenges of new businesses here on campus. As anyone can guess, just getting past the idea phase of development can be hard to overcome. Ideas are only as good as how much consumers will need or use them. “They have to understand that any idea only succeeds when it finds a market – customers who want to pay for what you have created,” York said. The Center for Innovation and Entrepreneurship or CIE is an organization based here in SLO that works with local startups to help them find success. They work together with the idea powerhouse known as the HotHouse based in downtown. 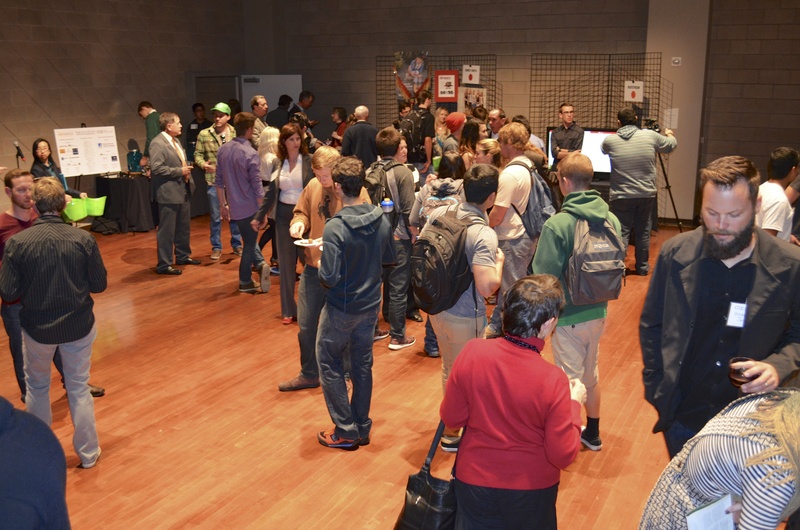 Cal Poly Entrepreneurs, an even more local branch of CIE and a club here at Cal Poly held a forum this past Monday. The forum featured seven startups looking for both support and ideas on how to improve. BeatStream a recent winner of the Startup Weekend SLO here at Cal Poly was there to show off a prototype of their website. The forum had a panel of Cal Poly alumni who had created their own startups to answer questions from both the audience and the businesses to be. One question that came up was at what point did they decide to switch from their idea just being a hobby to focus only on the business aspect. David Schlossberg, one of the panelists and owner of Poly Performance, said. Then he was relieved of his position selling computers and decided he should probably make it work out at that point. “It was a good outlet for me to spread the word to what I was doing and helping customers,” Schlossberg said. He added that when he was first starting many of the social media outlets used today were not available yet, so he was stuck on plain forums. Although it was a bummer none of these sites were ready yet, he also mentioned that he got as good or a better response from those specific forums. Nicole Macaluso, founder of SanTasti Inc., said. She mentioned it was a plus when you want to tell your customers about what’s coming up for the company. Announcements and product releases are easier. Of the seven different startups displayed on Monday, four dealt with technology and bettering the way people interact. One was all about fashion and making boots more stylish. Another created an armband you can use as a mini-survival kit if you get lost in the woods for a few days. It will be very interesting to see how many of these student startups will do in the future! “For students, many will not succeed the first time but will be in much better position for the next,” York said. Kyle Smit and Alexis Alhadeff “study” in a Cerro Vista den. I want to be a middle school math teacher,” she said. Michael Hehmann pours over some physics homework in a toasty 6th floor Cerro Vista apartment in preparation for his class the following day. Joseph Totterdell cooks up some dinner at 11:30pm as is the norm here in the dorms most nights. He doesn’t really know at this point what he wants to do with his major, but he’s glad he’s going to Cal Poly. Matt Dockery and partner Mary, both English majors, sit in bed working on homework due the next day. “I’d probably want to work for a publishing company when I graduate,” he said. Matt Dockery turns to his computer for some car mechanics websites. In addition to cars, Matt is a fervent player of DOTA 2. Freshman Jeremy Chen, in orange, part of That’s the Key, an a capella group here on campus, performs an impromptu beatbox session with a few other group members. This took place at the Run for Music on Sunday, January 26th. “I want to work at Google,” he said. citing the superior work environment and benefits that would make it a cool place to be. Kim Walters working with some friends on math homework in Cerro Vista. She is an industrial engineer who doesn’t have many plans for the future yet. Michael Hehmann pictured playing some Fifa during a work break. “In the future I really want to learn how to design computers, and do it myself,” he said. You could call it his goal in life. Peter fires up some DOTA late at night after he’s finished all of his homework. “I want to join a structural engineering firm probably,” he said. The civil engineering major wants to build bridges like the Golden Gate.